This countertop butter dish neatly stores butter at room temperature, keeping it spreadable without sacrificing any of its fresh flavor. The flip-top lid blocks exposure to light and air, while a built-in knife rest keeps the included spreader off the counter. There’s even a hidden ridge to scrape the spreader (or a knife) clean on. This was a gift to my daughter. I know that my daughter really likes this butter dish. The butter is soft and ready to use without being too hard or soft. This is the best butter dish I have ever had. It does all that has been advertised about it. I love everything about this dish!! 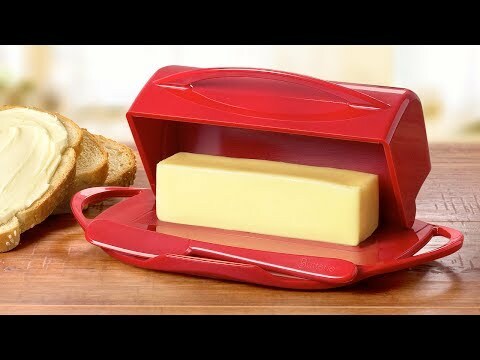 Butterie™ is compact enough to fit almost anywhere, and sized to hold two sticks of butter. It comes apart for easy cleaning and can go in the dishwasher, too. There’s a built-in spot for resting a knife (or the included spreader) and a hidden ledge for scraping it clean. This reinvented butter dish makes it easy (and cleaner) to have fresh, soft butter always on hand.